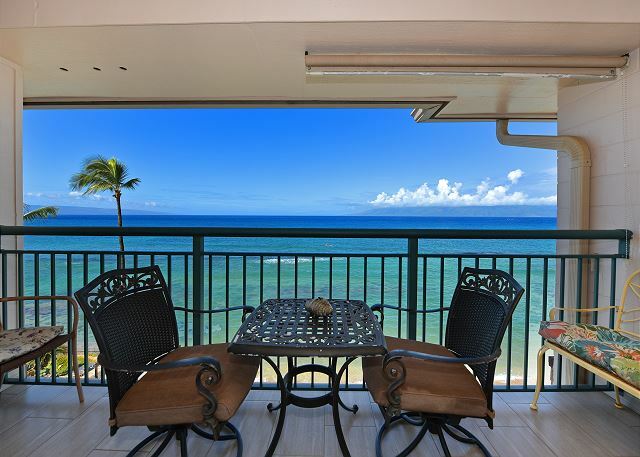 Makani Sands #302 is a 3brm 2 1/2ba townhouse on the 3rd & 4th floors with 3 lanais with spectacular view. Quick access to our beach and BBQs. 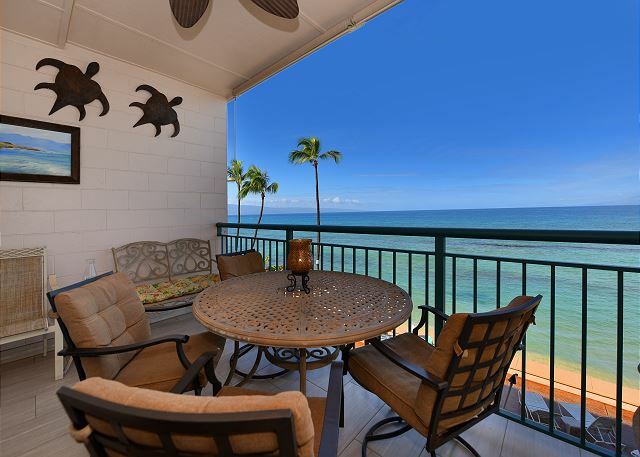 This beautiful condo is filled with art work by local Hawaiian artists. Gourmet kitchen with new sub zero freezer. Upstairs, master bedroom is on the ocean with a jacuzzi style tub and a private lanai on the ocean. 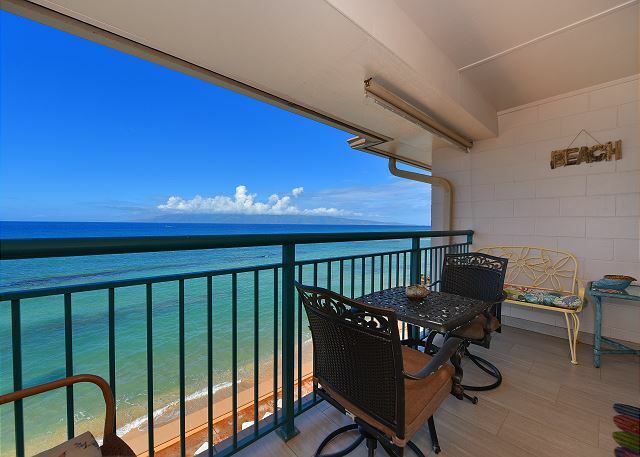 Guest bedroom has queen bed and private bath just totally remodeled 2017, lanai has mt. views. Downstairs is a 3rd bedroom, which is a converted office with a trundle bed which opens into twins. There is a sofa bed in the living room and a 1/2 bath off the hallway. New curtains in the living room and Tiger Bamboo floors upstairs.There are cable TVs, and there is a safe for your valuables. There is quick access to our beach for swimming, kayaking and snorkeling and there is a front row seat for whale watching during the winter months. 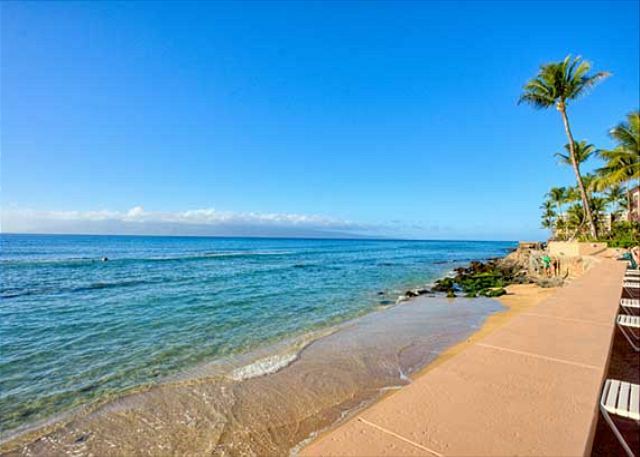 Come make Makani Sands #302 your home away from home while on Maui. Overall we were very satisfied with the rental. The apartment was wonderful and very well located. It was pretty much central to the places we visited! We hope we will come back some day! Much more than I had expected. The condo photos do not do the unit justice. It was more than I had expected from the listing. Everything was clean, and in well functioning condition. The terrace faced the ocean to the west, and gave us spectacular sunset views nightly. The art displayed in the unit was nice. My wife and I collect art, and enjoyed the extensive collection placed in the unit. We are considering purchasing a unit in the same complex after this stay. We will definitely return to this location. We stayed here with another couple, and one other friend (five total). There was more than enough room for the five of us to feel comfortable and for the apartment to feel roomy. The master bedroom is phenomenal - with a huge ensuite, a huge bed, and a nice balcony. The lower balcony could seat all of us (plus one or two more if needed!) for dinner, and is right over the water. The area below is swimable and we saw so many honu!! Every morning we’d see at least 2, right along the rock wall. You could easily walk to other accessible beaches, there’s a grocery store within walking distance and some food trucks, and restaurants. We absolutely loved our stay!! very beautiful, peaceful and serene! Great location, lots of turtles, sound of waves against the rocks, plenty of room inside the condo. Within walking distance of the park, grocery stores, coffee shops and restaurants. We had an excellent stay here! This condo surpassed our expectations, we spent 7 nights in 302, the place was spotless, the kitchen had every accessory you could possibly need, the beds were comfy, and plenty of supplies were provided. Staff is friendly, along with some of the condo owners living there. 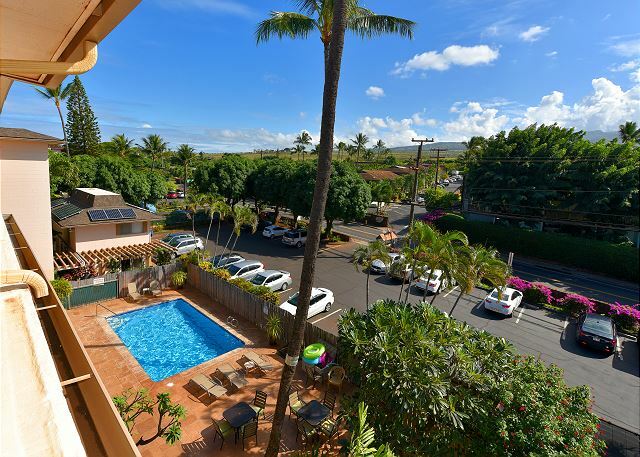 Condo is quiet, and your only a 7 minute drive to Lahaina. We saw a ton of turtles snorkeling right in front of the condo, along with plenty of fish. 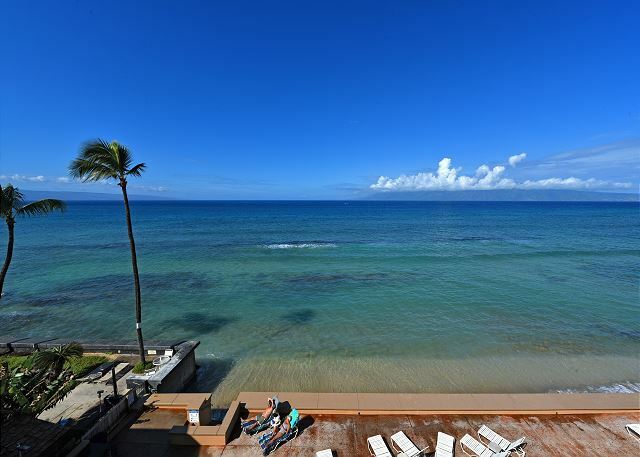 We had the pleasure of renting a unit at the Makani Sands as our destination to celebrate our daughter and her best friend as they completed their very successful sports and a high school experiences. The layout was great for two families with the office as the girls room and the adults upstairs. It was fabulous to be able to grill on the patio by the water, snorkel and play around the sea turtles that were right at the sea wall. 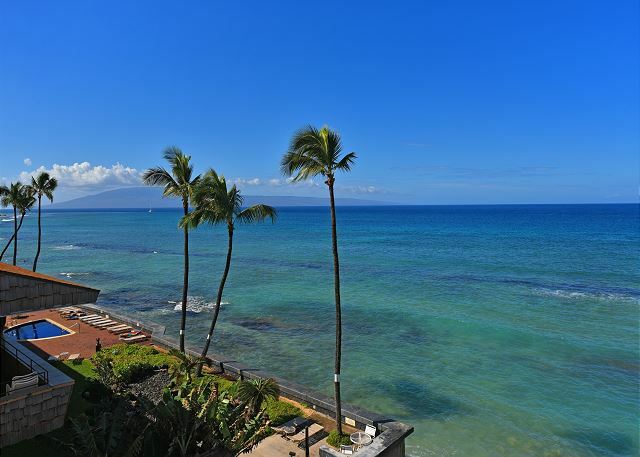 The location is great with other beaches, grocery and farmers market within walking distance. The staff was very helpful with ideas for the week. 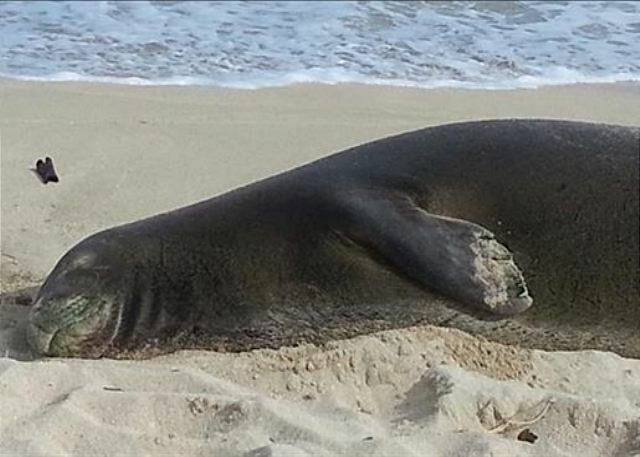 We look forward to another visit to the Makani Sands! We very much enjoyed this stay at Makani Sands. We were a little disappointed that the little sandy beach was no longer there and difficult to get into the water. The condo was very nice and clean. i personally reviewed and arranged rental details and found the “system” easy to navigate. The vacation / wedding experience for our daughter Ashley was tremendous. The staff at Makani Sands was exceptional, especially Marie who I had day to day contact with. she was polite and responded post haste to all of my needs. Very Nice location. Great ocean view. Condo was very clean and well decorated. Very much family friendly environment. Staff were very friendly and responsive. I will strongly encourage to try this condo if you are planning to to visit this island . 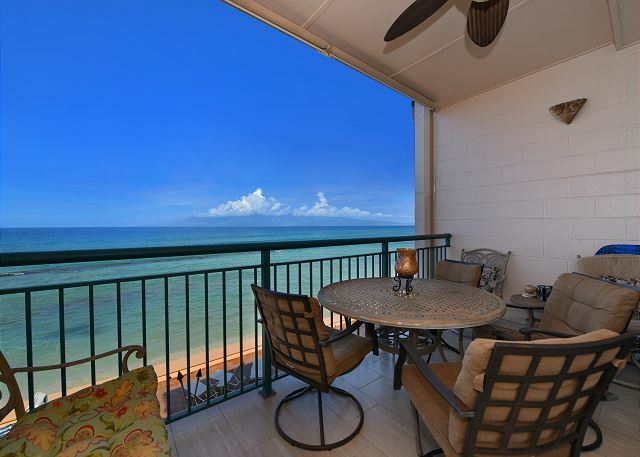 The Makani Sands condos are the perfect way to enjoy visiting the island with all the comforts of home. Lois Ann B from Tucson, AZ does not recommend this vacation rental. The view from the condo was great, however, we experienced a number of maintenance items during our stay. We had ants everyday, bathroom sinks were clogged up, air conditioning didn't work well for the first 2 days of our stay and the lanai door latch didn't work at all. Condo is very cluttered with too much furniture, statues, pictures etc. Mgmt staff was responsive but had to order parts, some of which did not come in while we were there. This could be a good vacation unit with a little more attention to it by the owner. Family of four stayed for 9 nights in June 2017. We loved the unit and complex. We explored the island and loved Maui but we were always happy to return to the condo and relax by the ocean and see the turtles feeding from the balcony. Easy to contact and people were quick to respond. Our only issue was the air conditioner with which the timer was broken and the unit became very warm through out the night. We brought this to the maintenance attention a couple of time. Hoping this was repaired ?? a guest from Ridgefield , WA does not recommend this vacation rental. Roseanne was very helpful; however, the other manager was less than friendly. The hot water faucet in the master bedroom did not work and we were told new management did not want to replace it. 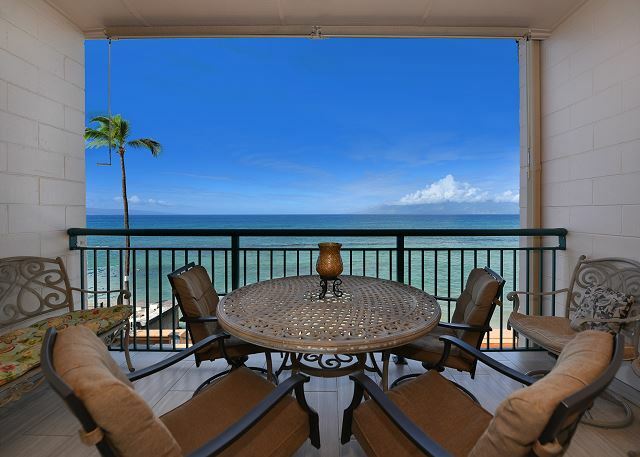 The furniture and rugs were not clean, there was too many chairs and table on the lanai, the blender leaked and the downstairs bedroom fan would not shut off. . it was nice to be on the ocean and location is close to markets and other beaches. We had a wonderful time at the Makani Sands and the location made it a quick walk to the park and farmers market. Also a 10 minute drive to Napili bay where you can snorkel wth the turtles. There is even snorkeling out front and the Turtles do come to sleep at nght n front of the Bulkhead. Unit 304 is beautiful appointed wth local are, that we were a little nervos wth the 3 and 1 year old Gandchildren, but all worked out fine. views were wonderful and the staff was great. One recommendation for owner would be to add a small dresser to the 2 other bedrooms for clothing. Our apartment was in a fabulous location- you right on the ocean. Turtles were in the water just out teh front & you could snorkel. 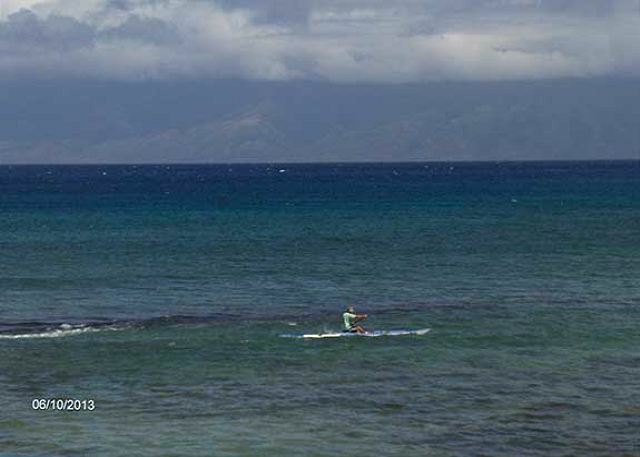 It was in a great location in terms of access to Lahaina other towns. The only thing we found hard was the amount of clutter in the apartment, it would have been nier to have less ornaments, but otherwise was fine. The management company were really helpful & great communicators. Very nice to so close to the beach and listen to the surf. Watched turtles every day. Kitchen was supplied with all needed utensils. Binoculars would have been nice, forgot ours. Older unit but was very nicely furnished and decorated. The girls in the office and Bert were all very helpful with any questions we asked. Our five siblings would stay again. Rickie R from Ocoee, Florida does not recommend this vacation rental. Wonderful location. Perfect accommodations for us. Not for your standard beach laying out vacation. Great for snorkling, boogie-boarding, etc. Good water sports. Really good, no disappointments. Loved the location, the views, the accommodations worked well for the 3 couples. We enjoyed our time here, but the property is showing its age. We had problems with two of the three bathrooms while we were here, and the elevator was out of service for a day. The operation of the A/C is totally bizarre, including setting timers and making sure every door in the unit is closed just exactly right or the AC won't engage. Also the property is not really oceanfront, it's actually *in* the ocean. There's about a foot or less of sand, and that's at low tide. It certainly doesn't look like the beach on their brochure. That being said the property manager Roseanna is lovely and quite helpful, and the onsite maintenance guy Bert is just wonderful. They do an outstanding job of helping guests as much as they can. 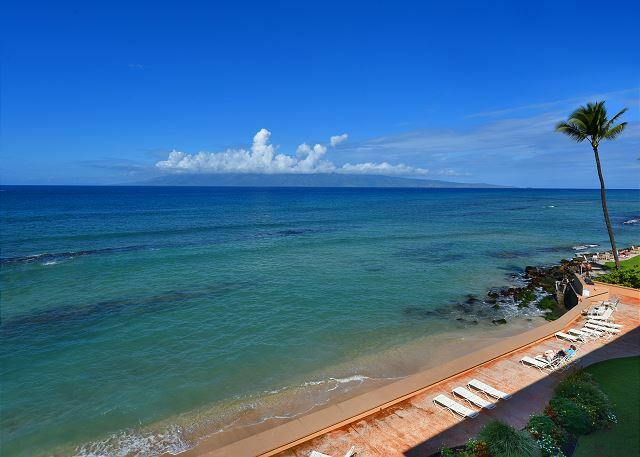 The location of Makani Sands is great - close to Kaanapali Beach and other areas. The unit has plenty of room for 5-6 people. Living room sofa is large and comfortable. 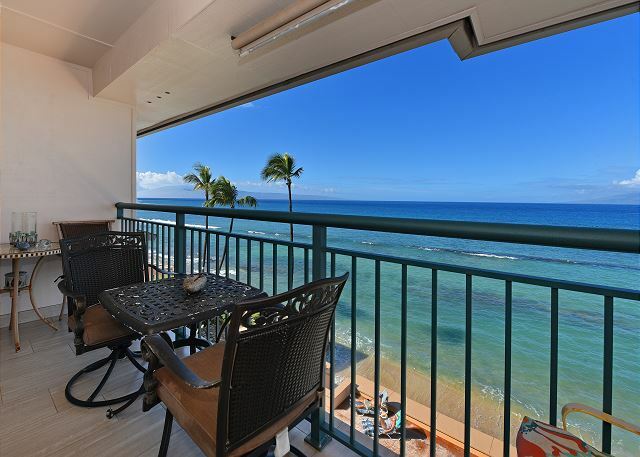 The main floor lanai is great for enjoying the sunset with drinks and dinner. Grounds are very well maintained and onsite management was great (Bert). one last note - what's with the weird looking orb in the living room? We arrived in Maui (2nd time) and were excited to see where the condo is located. Great shops, coffee (Bad *** coffee is right there - favorite place in the world), etc. Condo is a good size for my wife and I, 2 kids (trundle beds were adequate for small kids) and mother-in-law in the guest bedroom upstairs. We were hesitant about kids downstairs and us up, but it wasn't an issue. There are PLENTY of dishes, etc. and the appliances (toaster, stove, micro, oven, coffee maker, etc.) were just fine. The beds are very comfortable. It needs some touch-ups and fixes, but overall well appointed. The view - AMAZING. Pool, nice and warm for the kids. Beach was good in the a.m. (tide wiped out in p.m.) and lots of turtle watching (swam by 10 yards out every day). The only problem, and it is a big one, is A-N-T-S. There were thousands of them, literally and some even made it home with us in our luggage as we feared. We asked about it and they offered to spray, but we had kids. They really need to do something about it. I know it's the tropics, etc., but we had others staying in other condos down the road and nobody had any problem. We'd love to be back, but need the condos to be pest free. Unit could use a little updating but overall, very nice.